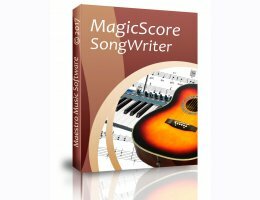 MagicScore SongWriter is an ideal software that works with song as well as instrumental material. The program is designed for songwriters, singers, choirs, students, and amateur musicians. Using MagicScore SongWriter, you can easily pass all the stages of writing a song, from the sketch of a melody, chords, and lyrics, up to publishing and printing. It is equally easy in writing down and editing solo and accompaniment parts. Multitude of convenient instruments that provide a comfortable work with sheet music and digital materials; these include templates of song forms, ensemble templates. Simple and convenient editing instruments. The program has all the editors, necessary for easy typesetting of lyrics, and fine tuning of sound. MagicScore SongWriter is a new and the most innovative program in the MagicScore product line.